Two Chicks On Books: Blog Tour- GRIM Anthology and a Giveaway! 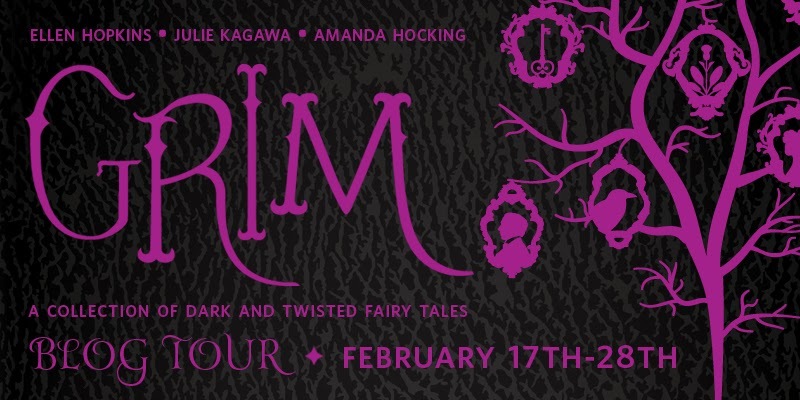 I am so excited to take part in the blog tour for the GRIM Anthology! I love fairy tale retellings and the 3 stories that I am covering today are all really good! I have 3 mini reviews for you and also I'm going to talk about how they comepare to the originals! Make sure to enter the giveaway below for a Harlequin Teen Prize Pack that includes GRIM and other great Harlequin Teen Books! Haven't heard of GRIM? Check it out! Now on to the reviews I'll talk about which retellings they are in my comparison after the reviews! THE KEY was what I expected from Rachel Hawkins. A good story although I had a hard time pinning down the retelling I knew what it was supposed to be but it was so short it was hard to nail it down. I always like her writing. The only complaint I have is that it was way too short I wanted more. Rating: Liked! You put something of Jeri Smith-Ready's in my hands and I will DEVOUR it! Just as I did with FIGMENT. This is another that I had a hard time figuring out the retelling but whatever I didn't really care what it was because it was AWESOME!!!! I adored Eli and "Fig" and it totally made me cry. Rating: OBSESSED!!!!!! Ok so let me tell you a little secret. I love Fairy Tales! Yeah the ones adapted for Disney are cool but I love the originals much more! I loved the darkness and the fear they instilled in children because they weren't the happily ever after tales that as a child we all wanted to be true. The originals were told to scare kids but they were rooted in real life. Children disappeared, men married women to turn around and kill them, and sometimes people just had awesome luck to only have it fail after a year or so. That's what I love about these they're not sugar coated HEA's. The authors in this antho especially Hawkins and Lo brought the darkness and embraced it. Hawkins story THE KEY was roughly based off of Bluebeard and it was really good! I wanted to have more of Skye though; his motives were unclear and I didn't understand how or why he was the way he was. I did want more though the ending was very open ended. Lo's THE TWELFTH GIRL was The Twelve Dancing Princesses with a modern update that I loved! She went way darker than the original and I loved the twist I also wanted more of this! And I loved that the "castle" was a dorm in an upscale prep school! Jeri Smith-Ready's was the hardest to nail down but I mean it had a cat wearing boots so maybe a take on Puss in Boots? But he/it was also someone who inspired people so I came to think of him/it as a muse. So maybe Puss in Boots with a bit of the 9 sisters mixed in. Regardless I freaking loved it!! Each tour stop is offering up a copy of GRIM, and one winner will receive a fantastic Grand Prize Package including the following Harlequin Teen titles: 2 copies of GRIM, a copy of WHITE HOT KISS by Jennifer Armentrout, THE SECRET DIAMOND SISTERS by Michelle Madow, THE QUEEN’S CHOICE by Cayla Kluver and an ARC of LET’S GET LOST by Adi Alsaid. Please enter via the Rafflecopter form. Giveaway is open to US/Canada and ends March 7th. Ooh there's a trailer now check it out!!! Love me some fairy tale re-tellings, especially an anthology! Wasn't Bluebeard redone recently in a full-length re-telling? I love how fairy tales are so popular! LOVE Rachel Hawkins and I'd love to see what she wrote! Jeri Smith-Ready's retelling sounds very original, with the guy as a guitar player and from a different POV, the cat's. Would love to read a Sleeping Beauty retelling!! I love fairy tale retelling. I have had my eye on this book for a while. There is some of my favorite authors in it. This is something new for me. Right now I'm starting a new book that is a retelling of Beauty and the Beast. I've read so many of those authors books so fun to have them all in one novel. So many retellings in one place makes me squee with joy. I love that 12 Dancing Princesses is finally becoming a thing to rewrite seeing as when i tell people its my favorite fairytale they have no clue about it. I looove fairy tales so I've been super excited for this one. Pretty excited for this book- I love a lot of these authors and I'm a big fan of rewritten fairy tales. I still have all the Windling/Datlow Black Heart Ivory Bones etc books! Ahhh I love fairy tale retellings so much, especially any really original takes on them. I'm sure these stories won't disappoint! So excited to see all these fairy tale retellings, especially with some of my favorite authors in it! I didn't know this was a thing until today but I am excited! Fairy tale retellings are always a lot of fun and some of my favorite authors are involved with this one. Looks like a great mythology. I love the creepy! I love short stories, espacially ones with a little scare in them. I would love to win this! Thank you for the awesome giveaway!!! I love the older fairy-tale stories that weren't always so sugar coated!!! I hope you'll take part in Fairy Tale Fortnight with us this year!! I'm really excited to r&r the GRIM collection. And what great authors!! I love so many fairy tales, I can't pick just one, lol! I can't wait for these retellings, esp. the Hawkins and Lo ones now! I'm really interested in seeing how the "new" stories go. I've love fairy tales all my life - should be good. Thank you . Grabby hands! I would love to add this one to my anthology collections! I'd love to read this anthology! So many awesome writers! This is amazing. I've been looking forward to this!!! 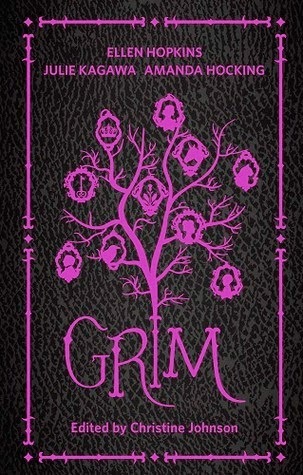 I've never read any Grim(m) fairy tales before but I am dying to read this book!